Sorry it's been so long (over a week!) since I last published a post. I can't even give you an explanation--or at least I can't give you a good one. Of course, I was on the road for three days early in the week (my husband, cat and I made our way from Austin, Texas, to Madison, Wisconsin), but I've hardly run myself ragged in the last four or five. 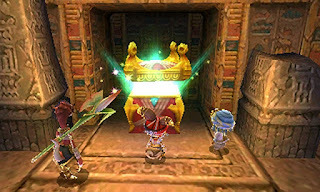 Ever Oasis demo (3DS)--Of the four 3DS demos and games I'll discuss here, this is the one I've enjoyed the least. Which is a shame, as every aspect of the Ever Oasis demo is at least "nice." I especially like the art style, although the character-switching gameplay is pretty appealing, too. The thing is, I didn't find the latter to be as appealing as I expected it to be before I started my way through the (disappointingly short) demo. 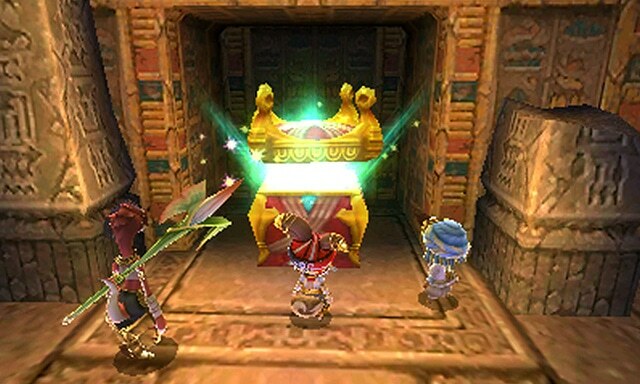 If I were forced to describe Ever Oasis' gameplay with a single word or phrase, I'd probably go with "by the numbers" as far as Secret of Mana-ish titles are concerned. Which is too bad, as I thought that component of the game would help set it apart from other action RPGs that've been released for the 3DS. On a more positive note, I've read that after a slow start, Ever Oasis eventually hits its stride in impressive fashion, so my current plan is to find a way to pick up a copy of it by the end of the year. Kid Icarus: Of Myths and Monsters (GameBoy)--Although I've been a fan of the original Kid Icarus since it was first released in North America back in 1987 (I even included it in my "10 Most Influential Games" series of blog posts), I've long avoided this 1991 sequel. Why? The main reason is that it never looked very appealing to me. 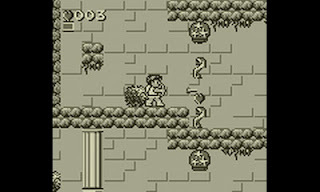 Playing a Kid Icarus game in black and white just seemed wrong to me after basking in the beautifully colorful--and weird--landscapes of the NES title. Plus, Pit's sprite here has always looked a little off to me. After a Twitter friend recently heaped praise on Of Myths and Monsters, though, I decided to finally give it a go. And you know what? I've had a blast with it so far. I can't say I prefer this GameBoy game's sprawling stages to the comparably straightforward ones found in the NES offering, but I'm enjoying them all the same. A similar comment could be made about Of Myths and Monsters' soundtrack, which is acceptable but never approaches the brilliance of the Hirokazu Tanaka tracks that fill the original. Still, I'm loving this handheld Kid Icarus overall--to the point where I'm now hitting myself for giving it the cold shoulder for so long. Metroid II (GameBoy)--Here's another portable sequel to a console classic I'm only now playing for the first time. Again, that fact boggles my mind as much as it probably does yours. After all, I was obsessed with both the original Metroid and Super Metroid for the SNES as a youngster (beating both multiple times, I should add). Unlike Kid Icarus: Of Myths and Monsters, I can't say I've avoided Metroid II because of what I considered to be below-par graphics. In fact, I've always thought Metroid II looked pretty awesome. Regardless, I dragged my feet on playing it until late last week. Despite the above, I'm not entirely convinced I'll stick with Metroid II until its end credits, but I'll certainly do my best to finish it. 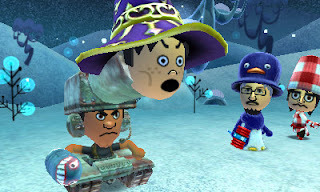 Miitopia demo (3DS)--After reading a few impressions of the Japanese version of Miitopia, I fully expected to dislike this Tomodachi Life-esque RPG--to the point that I canceled my pre-order for the North American release. After putting nearly three hours into the demo that just hit my region's eShop, though, I'm back aboard the Miitopia hype train. Chiefly responsible for that change of heart: the aspects I thought I'd hate--no real overworld to explore, battles that are mostly hands-off--don't bother me at all. Hell, I actually find these tweaks refreshing after playing a number of overly traditional RPGs in the last year or so. On top of that, Miitopia sports a surprisingly bold art style, a soundtrack that's more charming than it has any right to be and a gloriously subtle sense of humor. I've heard the full game isn't overly long, but that's OK with me--especially if it ends up being a short-but-sweet experience. Have you played any of these games or demos? If so, share your thoughts on them in the comments section below.